I haven't written much about Taichung, despite having drawn it and spent a lot of time there. I may cover it a little more as I find some new sites each time I visit. 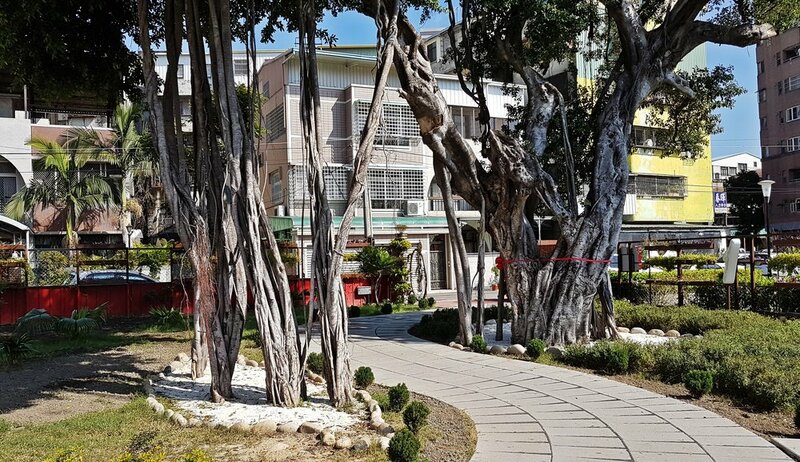 I decided to make a post of a few places around north Taichung I haven't found much in English about. Shuangshi Road translates as 'double-ten road'. This is most likely a reference to Double-Ten Day which commemorates the Wuchang Uprising. The Uprising set in motion the establishment of the Republic of China in 1911. Shuangshi is an important connecting road towards north Taichung and Fengyuan. It was important historically and in the Japanese era it was a very fashionable place to live. Many important institutions were located on or near this road and quite a few remain. The youth-orientated Yizhong Street runs parallel to the west and the monument strewn Taichung Park is south. Paochueh certainly doesn't hide itself so I was surprised to find almost nothing written in English about it. 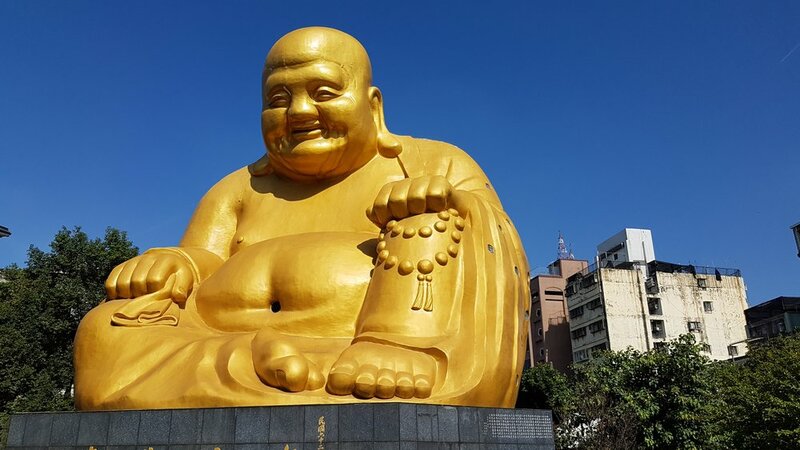 The most eye-catching part of it is the enormous golden laughing Buddha but the other parts are just as interesting. The main deities here are the Sakyamuni Buddha (better known as Siddhattha Gautama). Ananda Buddha (Siddhattha's cousin), Amitabha Buddha, and the Medicine Buddha. At a distance Paochuah looks entirely modern but to my surprise, hidden within a giant concrete structure, is the original wood and brick building. According to most sources, including Chinese Wikipedia, this dates from 1927. But I did find some other possible dates. It turns out the larger structure was built around the old temple to protect it from the elements. 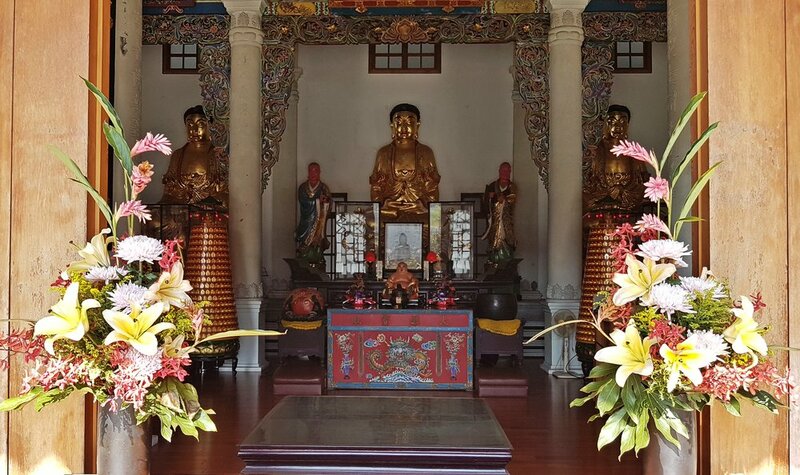 The original building is very elegant, with lotus leaf pillars and a detailed inner ceiling. The whole complex also smells strongly of sandalwood which I found very relaxing. The temple grounds have a very Japanese feel with a lot of stone lanterns and ornamental parkland. 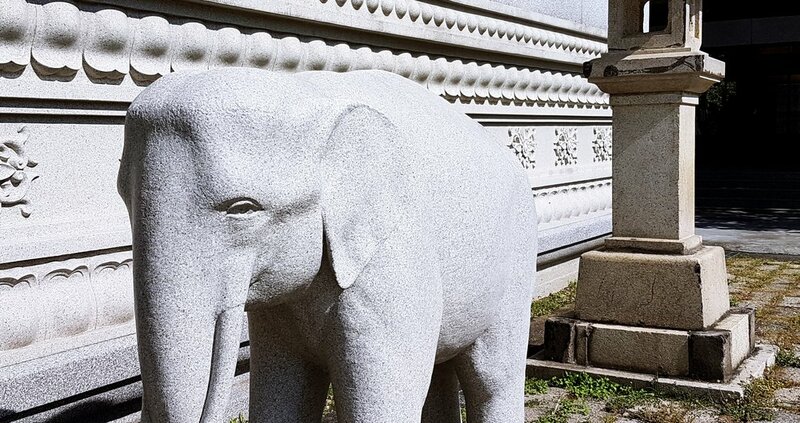 Instead of the lions that flank most Taiwanese Temples there are elephants here which bear more relation to the Sakyamuni Buddha's life. 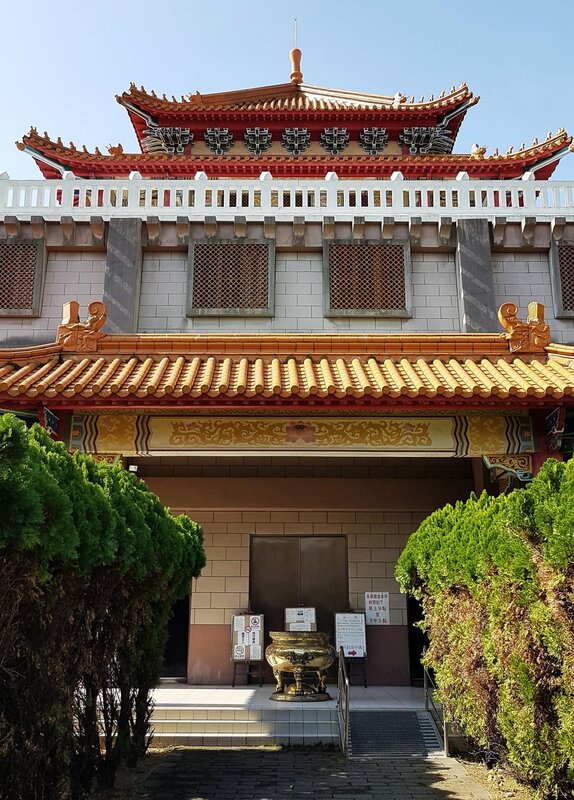 Although the temple has a distinctly un-Taiwanese feel it was founded by a Taiwanese monk called Miao Zen. Paochueh is one of the few sites in Taiwan that house Japanese remains. The colombarium to the left of the temple contains the ashes of Japanese colonial era residents, Japanese soldiers and Taiwanese recruits to the Japanese military. The only other site I've visited that also contained Japanese remains was the Zhonghe Temple complex at the base of the Battleship Rock Trails I visited here. I have read that there are just a few other similar sites in Taiwan. The colombarium cannot be entered unless you have relatives there. There wasn't actually a sign saying that however, just one saying no pictures inside. So I strode in and went straight up to the roof. The day was sunny and pollution free and I enjoyed this view before I noticed I'd been followed and was asked to leave. The large golden Maitreya Buddha itself was closed to visitors. It amused me a little that his belly button has a window. The statue is a 1990 rebuild of an earlier one built in the 60's. Besides the larger monuments there is also a small stupa-like memorial which I somehow completely missed but can be seen on this blog. About a ten minute walk further up Shuangshi is the recently restored Yide Mansion. Until 2015 the grounds of this building were overgrown and filled with the abandoned houses of a military dependent's village. The Taichung government spent about 45 million nt restoring it. The main house is laid out as a traditional Fujian courtyard house but the architecture is quite westernized. To the left of the main house is a pretty detached house with a slight art deco look. The mansion was built in 1925 by a wealthy merchant called Mao-Yang Lin. It was built following his marriage to Tuan Lai, which linked two influential Taichung families. Inside there are the usual displays of old furniture and tools, but also a bookshop and a bakery. 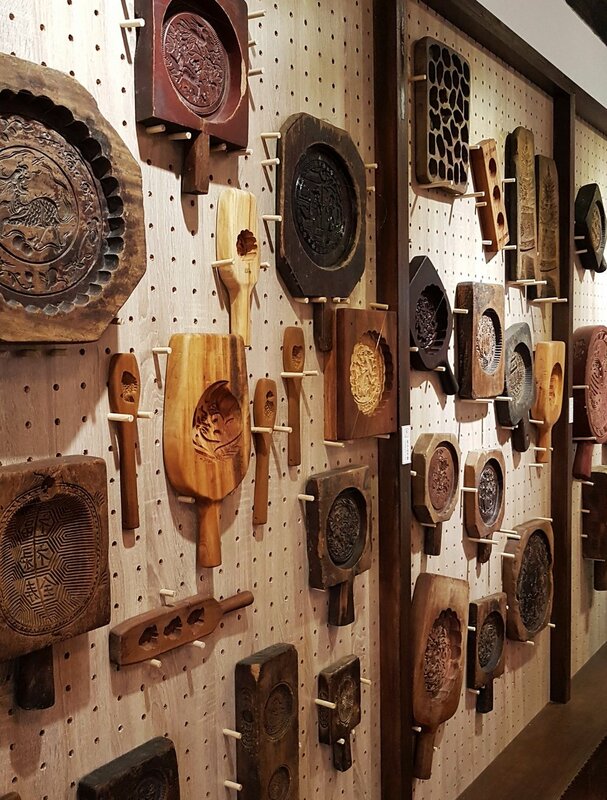 There is a wall of intricate cake design pans. Cake stampers? I'm not sure what to call them. The main hall also has some cool money banners designed to bring fortune. Head past the soccer stadium and down Diantai St. There are a few colonial era structures around the baseball stadium. The first is one of Taiwan's oldest water pump houses. This arched building is currently in use and it's not possible to enter. 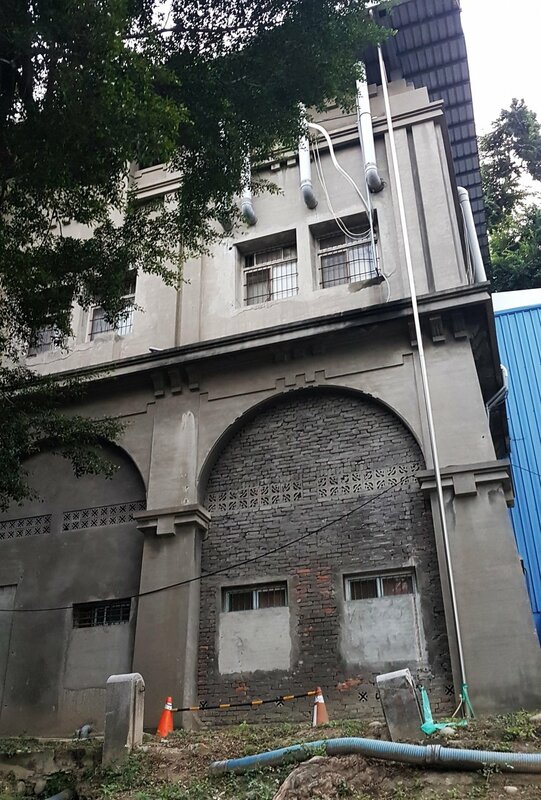 The second is the Taichung Radio Broadcasting Bureau from 1935. This one has been restored and is open to the public. This building for some reason makes me think of Spanish style Hollywood mansions from the 1930's. I think it's the castle turrets and the color. There was an art exhibition going on when I visited and some information on the building, including its role in the 228 Massacre events. Hugging the baseball station is an old village area called Shuiyuan. Although this looks like a military village it actually isn't. I've read, though I can't find that source anymore, that over time land ownership has become very fragmented and the village will be difficult to redevelop. At the moment it's a charming and chaotic mix of mid-century houses and a few older sanheyuan. A former Japanese water inspection building is currently a community center and a rustic wooden structure is currently used by the Council of Agriculture. The baseball stadium itself also sees regular use. Just south of here is Taichung Park with its beautiful lake pavilion and the Yizhong Street area. The sombre and in my opinion fairly ugly former Taichung Mayor's House sits on the opposite side of Shuangshi. I can't find for the life of me find my photos of this place. Before I started this blog I had an annoying habit of deleting many photos once I'd used them for a drawing. Especially if they were just regular street scenes. I expect it got caught in one of those purges so to get an idea of it follow this link. Yizhong is a lot like Taipei's Ximending. It's got some popular shops and has a busy night market running its length. There are lots of small boutiques, some nice design businesses, and a few historic wooden houses among the more grotty apartments. While walking around near Shuiyuan taking photos for the Taichung map a man sped up to me on his scooter. He said something in Taiwanese and gave me a metal disc. Then he drove off before I could say anything. After some research it turned out it was the guard from a samurai sword, molded into the shape of an egret or heron. I'm guessing it's quite old but I've no idea how old, and it's not in the best condition. I'd love to know why I was given it but I guess I'll never find out. You can see where all these sites are, and a lot more in Taichung, on the Hidden Taiwan Map here.